The cerebrum is the latest evolutionary feature of the brain and is the largest part of the brain. The cerebrum is located in the uppermost region of the central nervous system and contains the cerebral cortex, hippocampus, basal ganglia, and olfactory bulb. The brain is divided into three principal parts: the brainstem, the cerebellum, and the cerebrum. The largest part of the brain is the cerebrum, and it is further divided into various lobes and structures. What are the functions of all the structures? What critical roles do they play in enabling the human brain to carry out the complex functions is capable of? The cerebrum function is to direct thought and action through conscious or unconscious motor functions. Before diving too deeply into the functions of the cerebrum, let’s take a quick look at the other parts of the brain. The brainstem is the base of the brain and it is connected to the cerebral spinal column. Structures in the brainstem include the medulla, the pons, and the midbrain. The brainstem’s primary function is to relay signals coming from the cerebellum and cerebrum to the spinal column. Many involuntary or automatic responses are handled by the brainstem, such as sneezing, coughing, and swallowing. The brainstem also regulates your body temperature, heart rate, and your breathing. The cerebellum is found just under the cerebrum. The cerebellum’s primary function is to handle things like posture and balance. The cerebellum also plays a key role in the carrying out of voluntary movements. Most movements are the result of a variety of different muscle groups acting together, and the cerebellum coordinates the timing and actions of these different muscles to ensure fluid movement. 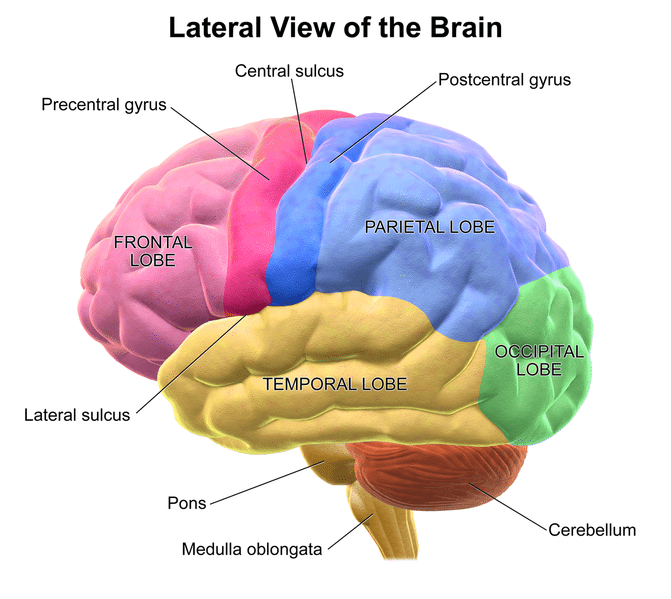 The cerebrum itself is separated into four different lobes: the frontal lobe, the parietal lobe, the occipital lobe, and the temporal lobe. The frontal lobe of the brain is typically associated with planning and reasoning, as well as emotions and problem-solving. The motor cortex is found in the rear of the frontal lobe. The motor cortex receives information from the other parts of the brain and uses it to ensure that the movements of the body are carried out. Meanwhile, the occipital lobe is found at the back of the brain and is primarily responsible for the processing of visual information. The primary visual cortex is responsible for receiving information from the retinas in the eyes and then interpreting that information for use. The parietal lobe is found on top of the brain and it is thought to be responsible for the perception of various stimuli, orientation, movement, and recognition. The parietal lobe is home to the somatosensory cortex, which enables the body senses to be processed and relevant information extracted from them. The temporal lobe perceives auditory information and it is further associated with speech and memory. The hippocampus is found in the temporal lobe, and the hippocampus is responsible for handling memories. Damage to this area of the brain is likewise associated with memory problems and language deficiencies. The pituitary gland is connected to the hypothalamus by a region known as the pituitary stalk. The pituitary gland is responsible for controlling the endocrine glands within the body, and it secretes hormones which stimulate and control sexual development, fight off disease, handle stress, and control the growth of muscles and bones. These four parts of the brain make up the “cerebral cortex”. The cerebral cortex itself is divided into two different halves, referred to as the right and left hemispheres. If you only looked at them the two halves of the brain would look largely equivalent to each other, but in truth, the right and left hemispheres are responsible for somewhat different functions. It is thought that the right hemisphere handles more creative tasks, while the left hemisphere takes on tasks associated with logic and reason. This is a bit of an oversimplification, as it is increasingly thought that both hemispheres are required to carry above logical and creative tasks. The cerebrum has structure within it called the neocortex. 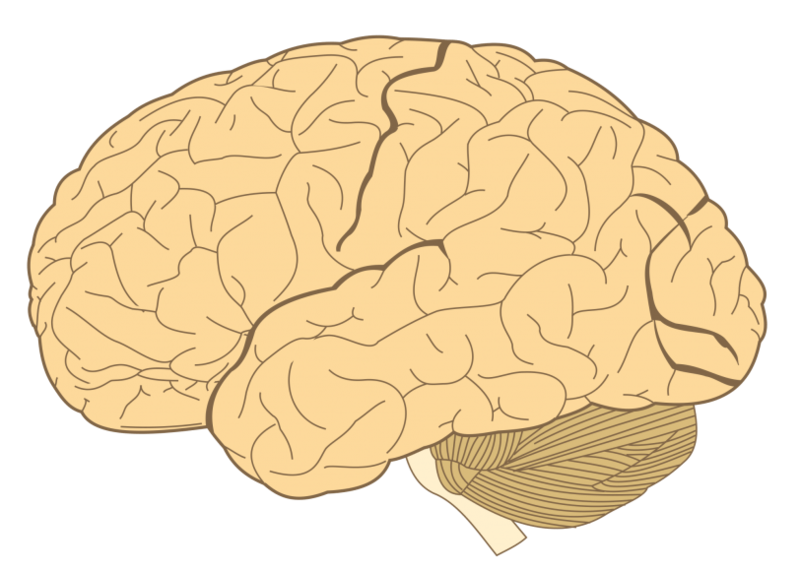 The neocortex has six different layers, and it is unique to mammals. Research suggests that the neocortex could be a structure that evolved relatively recently in evolutionary history and that it may be partly responsible for the more sophisticated information processing seen in complex mammals like primates, dolphins, and of course humans. The neocortex is smooth in small animals like rats, but in humans and other higher mammals, it has deep grooves in it referred to as sulci and prominent wrinkles called gyri. The corpus callosum is a thick bundle of axon fibers which connects the two halves of the brain together. The corpus callosum contains over 200 million axons, and the sheer density of these connective tissues facilitates easy communication between the two different halves of the brain. The corpus callosum is also home to the biggest collection of white matter in the brain. White matter is responsible for carrying the signals that transfer between the nerve cells and move to various parts of the brain and body. Essentially, white matter facilitates communication between the different portions of the brain while gray matter is utilized primarily for thinking, computation, and memory. The gray matter makes up the top layer of the brain’s surface, and it is what you see when you look at the brain. The gray matter of the cerebral cortex has many different wrinkles help make the brain more efficient since the brain is able to increase its amount of surface area without greatly increasing in size. This increased surface area means there are more neurons and more computational power. 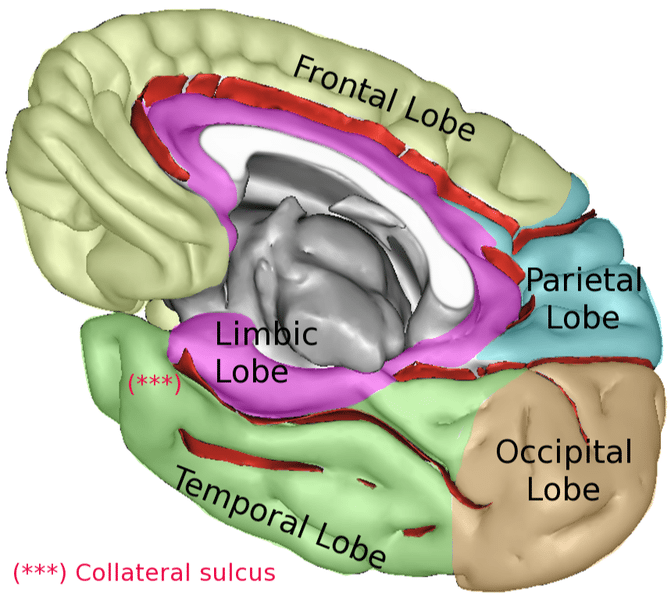 The four lobes which make up the new cortex are supported by a variety of deep structures. These deep structures include the pineal gland, the thalamus, the limbic system, and the basal ganglia. The pineal gland is responsible for regulating the body’s circadian rhythm and internal clock. The thalamus functions as a critical juncture for all information coming and going from the cortex. The thalamus is also connected with attention, memory, pain sensation and alertness. The basal ganglia works alongside the cerebellum to handle a variety of different motor functions, particularly fine motor functions like the movement of your fingertips. The limbic system includes the hippocampus, the amygdala, hypothalamus, and the cingulate gyri. The limbic system handles most of our emotions, memory, and learning.